When I came home from the hospital with both of my babies, so did a whole stack of important paperwork. When you’re a busy mom with a newborn, the last thing you want to do is figure out where to put all your baby’s important papers, such as their immunization records and those all-important breastfeeding instructions. So, what did I do? What most moms do: I threw everything in a manila folder and that’s where all my girls’ paperwork lingers today. But, moms, your baby’s paperwork is far too important to be stuck in a boring, old manila folder and Tamar Shay, Founder and President of Organized From the Start, Inc, believes so too. 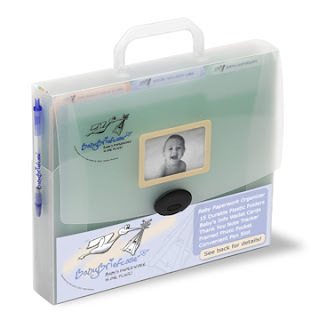 Shay created the Baby Briefcase for all parents who need that special place to put all their baby’s important documents. So, what’s inside? Child Care Search; Pediatrician Visits & Healthcare Receipts. The Baby Briefcase retails for $29.95.